Thursday saw another game of Maximilian 1934 in the gaming room. Only myself and Drew were able to make it this week so we played a Death Match with each of us having two $1000 vehicles. Drew again ran Red Bess, a jalopy with a pintle MG, extra armour (1pt each F&R, L&R) and armoured engine, he also upgraded the driver to be both driving and gunnery '3'. 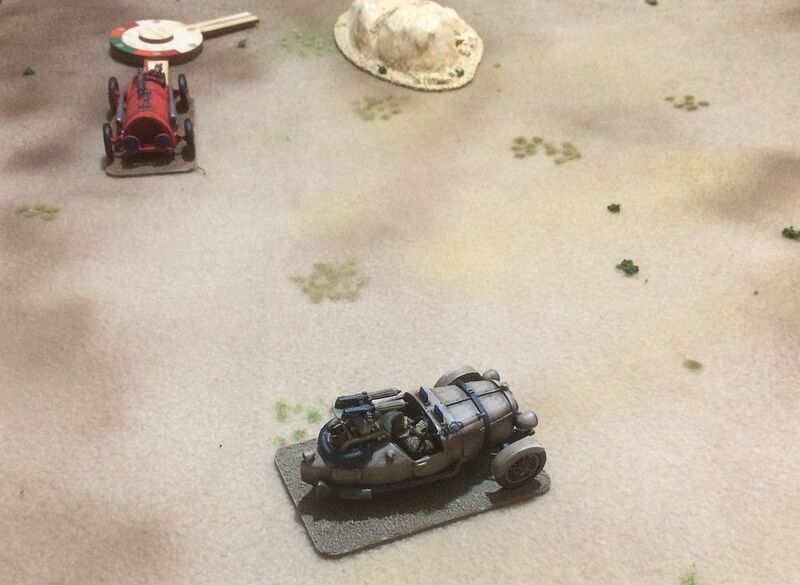 Alongside this he used the newly painted Black Death a jalopy with two light cannon, extra armour to the front and the driver upgraded to be both driving and gunnery '3'. I decided to use my two 1st Corps vintage speedsters. Firstly Sand Piper a buggy armed with three fixed machine guns and with the crew upgraded to driver skill 3 and gunnery skill 4. This was teamed with Green Nasty a jalopy armed with a pair of pintle mounted machine guns and a pintle mounted light cannon, an armoured engine and additional side armour complete the ensemble. Green Nasty does not appear in any photos of the game, but can be seen here. Game 1 was a short and brutal affair, some deadly shooting by Sand Piper saw Red Bess with a dead driver in the second turn of the game. A couple of turns later Black Death had been cornered and dispatched. We lined them up again! The second game was much more involved. Both sides were a lot more cagey and the initial shooting was nowhere near so deadly. Red Bess and Sand Piper paired off again and were chiselling lumps off of each other. 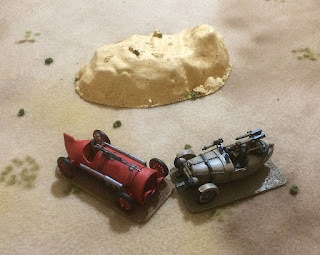 To avoid a collision Sand Piper slammed on the breaks, Red Bess missed the fate roll and in the ensuing head-on Sand Pipers driver was killed and Red Bess immobilised! The wide turning circle of Black Death meant that Green Nasty had the initial advantage, but the lack of driver skill soon showed and Green Nasty had rolled a couple of times trying to make tight turns to keep inside Black Death. Every so often Black Death would swoop by hammering cannon rounds into the stricken vehicle and Green Nasties engine and steering were shot up, but Black Death was taking mounting damage whenever Green Nasty could reply. Finally, Black Death succumbed and Green Nasty was the last car standing, although probably on its side at the time. 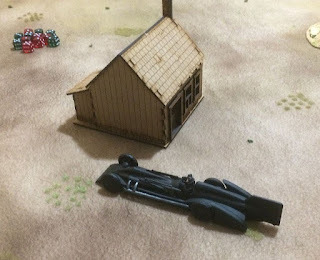 A good couple of games again, but long vehicles like Black Death do seem heavily penalised in this sort of scenario, I also think it would have benefit from more players.